« What’s Going on in Williamsburg? We have a trifecta of quotes today, from the prolific British essayist and poet Joseph Addison (1 May 1672 – 17 June 1719). Addison was a contributor to his friend Richard Steele’s 1709 journal The Tatler, then in 1711 he and Steele founded The Spectator. Addison contributed the majority of the brief essays in The Spectator. It’s interesting to me that the sentiment from Addison’s play was later used by Hale, but that’s not the primary quote I’d like to focus on this morning. As someone who tries to write things he hopes will be read — even little blog posts like this one — I appreciate that idea of reading as mental exercise that improves “the health of the mind.” One might argue whether or not Addison was correct in identifying that health with virtue, but I come down on Addison’s side on that. Why? Because a modicum of virtue is necessary to success, especially in a complex society where we must work together with other people to succeed in any endeavor. Without some measure of virtue, we are unlikely (for instance) to show ourselves to be trustworthy or reliable enough for others to work with us. 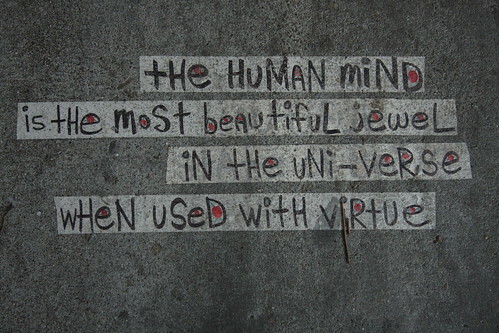 The kind of virtue we need to develop begins and indeed resides in our own healthy-thinking heads. Does it not seem, in our current Internet-and-social-media-age, that many people are quick to discount any contrary opinion about any available subject, and in so doing to heap scorn and derision upon the other side? Do they not seem to discount even the possibility of virtue in people on the opposite side? To borrow from Addison in describing the fragmentation of our polity, it seems to me that we live in an age of uncharitable stupidity, and I hope we grow out of it. This week, then, I will take care to be more charitable and try to be less stupid, by reminding myself that my side (of whatever argument) does not have a monopoly on virtue and that “friendly opposition” in our internal politics is not only possible, but preferable. Anybody else up to that challenge?